I was reading an opinion post the other day asking why people on either side of the US gun control argument can’t talk to each other. I think there are multiple reasons, but one that stands out to me is fear of guns and lack of knowledge about their safe use and handling. OK, who wins this Thunderdome battle of immorality? Sad, an era might be coming to an end. No Federer in a slam since...the last century. His days of winning slams are over, but he was still a top ten player with an elegant style the likes of which will never be seen. BUT, this is Djokovic's time. Oh so close last year, and just one unreal Wawrinka in the French Open away from having the best year in tennis history, he has, improbably, shown that he could top that in 2016. He should be the firm favorite although he may have a few more obstacles in his way this year than he did in 2015. I expect him to win it, but with a few hiccups. However, this is a different prediction: a "no guts, no glory" version. So this happened in February 2016: Justice Scalia died. 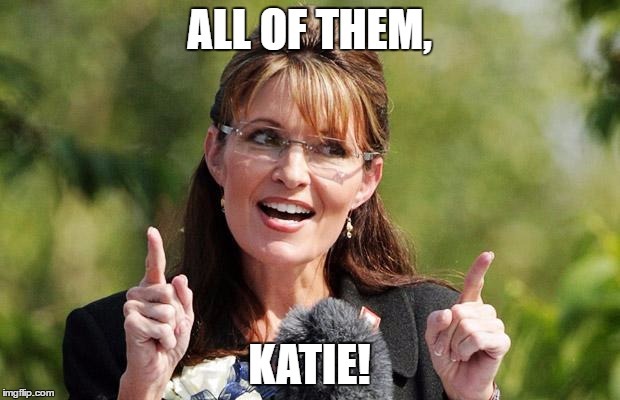 And unexpectedly, President Obama got the opportunity to nominate another judge to the Supreme Court. How did the Republicans respond? Within minutes, the battle lines were drawn with warnings that President Obama should not be doing so because his mandate was stale. They then escalated the threat to a new level: they refused to even consider anyone President Obama would nominate. Forget confirmation hearings, they vowed to not even meet with him. Go ahead, take a look at that headline, and tell me what's wrong. 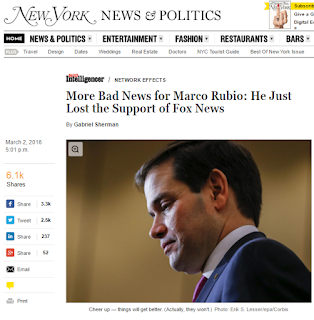 "We're finished with Rubio," Ailes recently told a Fox host. 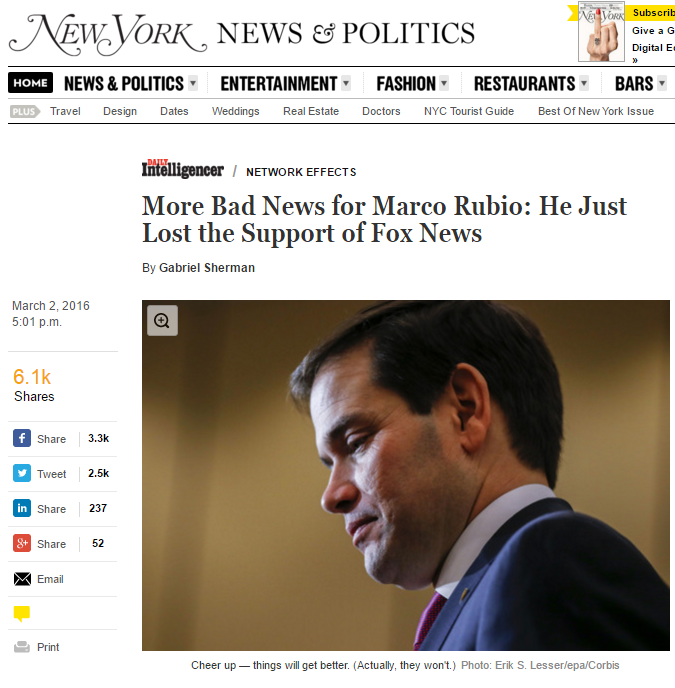 "We can't do the Rubio thing anymore." It is not that Rubio is "out." But that a supposed news organization is openly providing a politician unstinting support to boost his chances. Forget that such is grossly unethical for a second. What does it say when the rest of the media ignores that offense and instead are somewhat joyous that the politician is getting dumped? One of the most consequential of the Supreme Court justices over the last half a century died yesterday, at the now not-so-old age of 79. 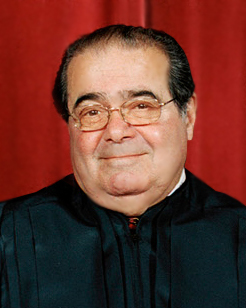 Antonin Scalia was confirmed in 1986 by a 98-0 vote by a Republican majority (narrow, 53-47) Senate. He had by then established himself as a staunch supporter of presidential executive privilege under President Ford and was expected to be the Solicitor General of the US under President Reagan but was passed over. A devout Catholic with nine children, Scalia often presented an exceptionally astute rationale for his positions, which when combined with his caustic wit often glossed over or excused his rather overt dedication to conservatism—or strict originalism as he was often credited with. Whatever one might have thought of his rationale, even his most ardent critics acknowledged his judicial intellect. His disdain for his fellow colleagues became increasingly apparent with age, and terms like 'jiggery-pokery' became popular in pop culture.